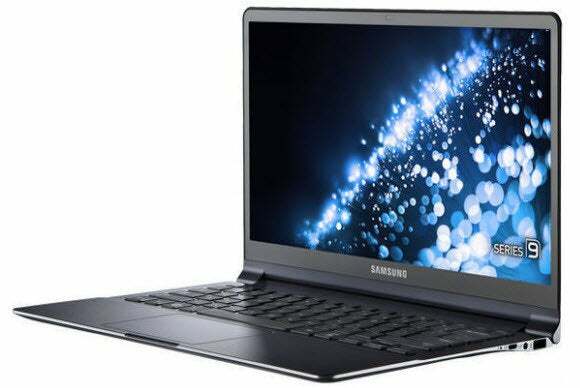 Samsung refreshes Series 9 Ultrabook, but where’s the ‘Retina’ display? Retina who? Not to be outdone on the display front, Samsung is showing off a 13.3-inch LCD notebook panel with a whopping 3200-by-1800 resolution screen. Samsung Display will showcase the high-resolution screen during Display Week 2013 in Vancouver, British Columbia. Samsung's panel has a pixel density of 276 pixels per inch. If Samsung or other PC makers bring this display to market, it would easily outshine Apple's MacBook Pro with Retina Display (227 ppi), Toshiba's Kirabook (221 ppi), and Google's Chromebook Pixel (239 ppi). But that's a big “if” in the near term, considering that Samsung hasn't actually announced any products that use the display. Last August, the company showed off a prototype 13.3-inch laptop with a 2560-by-1440 resolution panel (pictured above), but that hasn't come to market yet, either. High-resolution laptops have their drawbacks. Processing power must be greater than laptops with lower-resolution screens, which drives up the base price. Larger batteries are also necessary to power all those pixels, resulting in thicker and heavier designs. What's more, it'll be a while before software fully takes advantage of these high-resolution screens. Many desktop applications and Websites aren't designed with Retina-like resolutions in mind, so users can end up with tiny buttons and images, or ones that become blurry or fuzzy due to unnatural stretching. Over time, the hardware obstacles will be easier for PC makers to overcome. (Samsung, for that matter, says its upcoming crop of high-resolution displays offer a 30 percent power savings over existing LCD panels.) And as more laptops with pixel densities above 200 ppi hit the market, software will likely become more accommodating. With a major display maker like Samsung entering the ring, the death of the pixel is getting ever closer.